A word that has gained popularity in recent months is "—splaining". As you can see, it is based on explaining, but current lingo often means that someone is pretending have greater knowledge than he or she actually possesses. Also, it is done in a condescending manner. Advocates of muck-to-man evolution are fond of evosplaining to biblical creationists and the unwashed masses. Some owlhoots refuse to admit that Neanderthals were fully human. Despite all the evidence to the contrary, they will seek out evoporn that makes them feel good about their preconceptions. 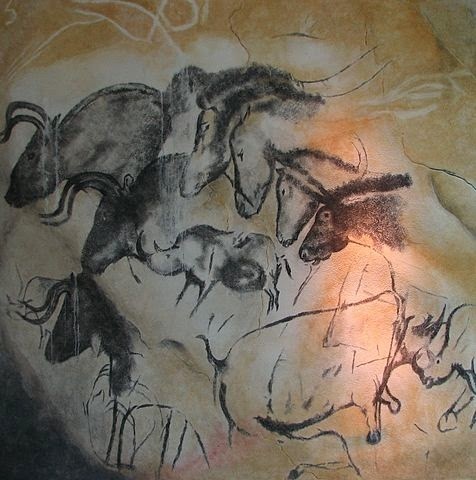 One claim to keep the myth in the saddle is that Neanderthals did not make recognizable art. That story was based on evolutionary presuppositions that the art was done by more modern humans instead of Neanderthals. This idea was given a serious slap down a few years ago, and the fact of Neanderthal-made art has been gaining evidence more recently as well. Scientists ignore research from other evolutionists, and then commence to ignoring other research to advance the storyline. Insisting that since Neanderthals did not produce art, they developed spear throwing ability instead. This supposedly led to them growing bigger brains, and therefore greater intelligence. Here we encounter another bit of data they conveniently ignore: brain size does not indicate intelligence! Neanderthals having bigger brain cases than modern humans is also ignored. Also, according to dubious dating methods, spear throwing occurred further back in time than is convenient for the evolutionary storyline. Darwin's disciples seem to use the fallacy of exclusion frequently, don't they? In addition, the whole thing stinks of Lamarckism. A quick summary of that concept is the famous "giraffes grew longer necks so they could eat leaves on trees" line. (Papa Darwin rejected most of Lamarck's ideas, but still held to a few anyway. Hedging his bets, I think.) Offspring of javelin hurlers may have physical structures conducive continuing the activity, but that comes from genetics, not learned physical skills that were passed along. This spear-throwing business is yet another example of bad science dressed up as legitimate research. It is a weak rescuing device. Unfortunately, Darwin's Flying Monkeys© resort to confirmation bias in their evosplaining and use it to reject the truth of the Creator. Cowboy up, gang, the evidence — including "your" evidence — refutes evolution and supports recent creation.